Over the last two weeks, I have looked at a long-gone alley in NE Washington, Schott’s Alley. While the press at the time was almost uniformly negative, the longer piece by Pauline Pry was particularly dour, to the point that it seemed that the author had some kind of ax to grind. whatever you term it, was a Shangri-La to us. The Shangri-La of Northeast Washington. I would say the Shangri-La of Washington, D.C., because we were in an enclosed area all to ourselves. We could play, do this, do that, whatever. Yes, it was a three sided, it was the three-sided building, wide open on the east side and that’s where we went because we had the entrance on First Street and we would just go down the Alley, Court or Place, we would just go down and go right in the into the open of the Russell Building, you call it now, Senate Office Building, we termed it then. The Senate office building used to be wonderful skating on the corner of First and B Street, now known as Constitution Avenue, because they had marble steps there and we used to love to ride on the first two steps because they were so smooth with the skates. Ambrosi also mentions that he was baptized at St. Joseph’s Church, just up the street from his home. 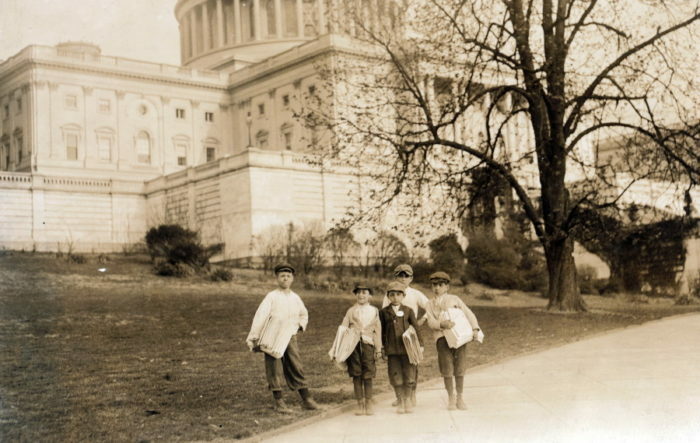 While he did not attend the school attached to the church, it seems that the students enjoyed the same things he did, including the local drug store and running wild in the Senate Office Building. In short, this was not at all the dangerous place described by Pauline Pry. It must be stated that some 20 years separate the two stories, but it seems unlikely that the alley would have experienced such a dramatic shift in the intervening time.